This horse tapestry "On the Range" shows a cowboy and his horse in action. Here we see a beautiful scene of a cowboy and horse among the plains where the dust has been rustled to create a misty effect which matches the clouds to create a dreamlike state. The color pallette is cohesive and makes use of browns and creams, to allow the play of light in this piece to come through all the more strongly. The illumination in the scene is through the sun behind the clouds and the softened back light is perfect for the atmospheric mood and feeling in this work. 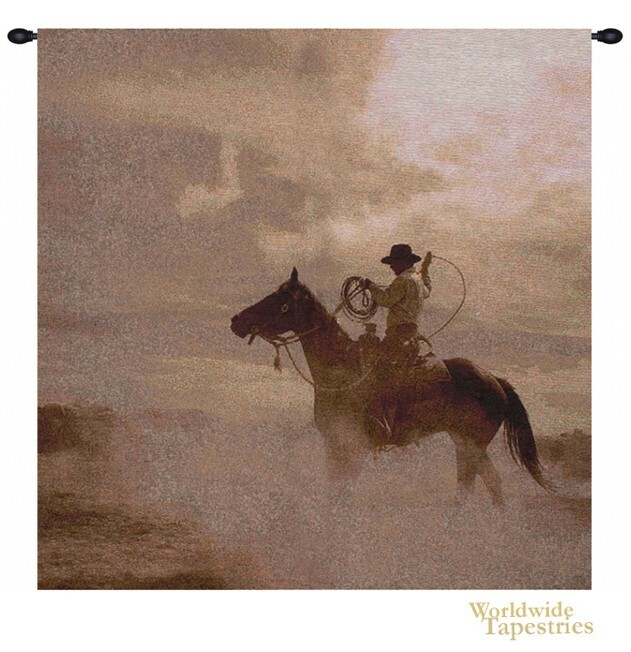 This horse tapestry "On the Range" is backed with a lining and has a tunnel for easy hanging. Note: rods and tassels, where pictured, are not included in the price.